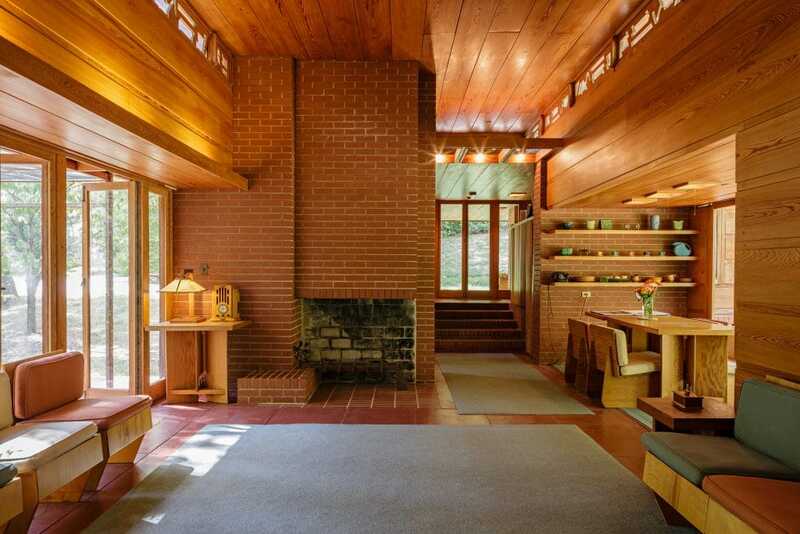 As the only public Frank Lloyd Wright work in the National Capital Region and owned by the National Trust for Historic Preservation, the Usonian-style Pope-Leighey House is nestled within a small wooded grove on the same site as the Trust’s historic Woodlawn mansion in Alexandria, VA.
Holding the distinction of being relocated twice, the house represents a continuing commitment by the National Trust to make this magnificent example of early Usonian design accessible to the public to enjoy. The Pope-Leighey House, named for its only previous owners, is modest in size at only 1,200 square feet. Bounded by the humble budget of the Pope family, who commissioned the house from Wright in 1939, this structure nonetheless exhibits the distinct features characteristic of his formidable vision and style. The architectural element of compression and release, the cantilevered roofs, and the windows that open to the outside create an immediate interaction with the surrounding landscape. They also create a sensation of spaciousness and allow plenty of sunlight into the home. This house seems to reach far beyond its square footage and exudes the cleverness and comfort of true mid-century design. Although Pope-Leighey House is a relatively young house within the surrounding preservation community of Virginia, its history is highlighted by recognition of its architectural significance and its stakeholders’ efforts to protect it. After Loren and Charlotte Pope sold the property to Robert and Marjorie Leighey, the house was subject to demolition with the planned construction of a Falls Church, VA, segment of Interstate 66. Marjorie Leighey took considerable steps to raise awareness of the house in an effort to save it from demolition, even enlisting the personal efforts of Secretary of the Interior Stewart Udall. Finally, the National Trust for Historic Preservation acquired the home and relocated it to Alexandria, VA in 1965. In 1995, the house was moved once again, by just 30 feet this time, to better preserve its foundation and structural stability. The Pope-Leighey House continues to operate as a historic property and is open seasonally for public tours and private events.